2011 Biennial Beijing: Super-Organism. Central Academy of Fine Arts Museum, Beijing, China. "Portraits, Kevin Clarke". Chateau de la Treyne, France. "Genetic Reveries" Janos Gat Gallery, New York. Catalog. "Kevin Clarke- Portraits of the Future" Hecksher Museum of Art, NY. "Dust to DNA, Kevin Clarke and Mikey Flowers 9/11" International Center of Photography, New York. Atrium project: 6 Portraits. B-W Bank Stuttgart, Permanent installation. "The Invisible Body," Museum Wiesbaden, Germany. "Vernal Passage," Grand Salon, New York. "Love and Life. Portraits of Women from the Klöcker Collection". Lehmbruck Museum Duisburg, Germany. "KONZEPT. 20 Years Collection DZ Bank Frankfurt." Art Foyer Gallery. Frankfurt. Biennial Beijing: Super-Organism. Central Academy of Fine Arts Museum, Beijing, China. "FAME" DZ Bank Art Foyer Gallery. Frankfurt. "typisch! Klischees von Juden und Anderen" Jewish Museum Berlin. Catalog. "A Promise of Photography" Moscow House of Photography, Russia. "Art is not Untouchable" Pablo's Birthday, N.Y.
"Relating to Photography. Highlights from private Collections" Fotografie Forum International, Frankfurt. "Face To Face, Masterworks From The Collection of the DZ Bank." Galerie der Stadt Stuttgart. Germany. Fotosommer Stuttgart, Galerie Sturm . "Paradise Now" Tang Art Museum, Saratoga, N.Y.
"Paradise Now" Exit Art, N.Y. Catalog. "Gene Worlds," Portrait of John Cage, Bundeskunsthalle, Bonn, Germany. Catalog. "Power by Consent," artcenter of South Florida, Miami Beach, Fl. "Willem de Kooning, Retrospektiv" Akademie der Kunst, Berlin. "POOL" Artist"s Space, New York Catalog. KUNST UND MEDIEN, MATERIALIEN ZUR DOCUMENTA 6, 1977 Stadtzeitung und Verlag, Kassel. Documenta 6 anti-catalog and prize-winning best seller. 300pp. Text and photographs. KAUFHAUSWELT (Department Store World), 1980 Schirmer + Mosel Verlag, Munich. Black & white photographs by Kevin Clarke in Kaufhaus Des Westens (KaDeWe) in West Berlin. Text by Hans J. Scheurer. THE RED COUCH, A PORTRAIT OF AMERICA, 1984, Alfred van der Marck Editions/ Harper & Row. Photographs of Americans on a red velvet couch. Photos by Kevin Clarke and Horst Wackerbarth, text by William Least Heat Moon. PORTRAITS, KEVIN CLARKE, 1998 ( x+c ). Portraits including From the Blood of Poets and Portrait of John Cage. Text by Alan Jones. THE INVISIBLE BODY, 1999, Museum Wiesbaden. 118pp. Twenty-six portraits of people from New York and Frankfurt by Kevin Clarke plus texts and background history by Dr. Volker Rattemeyer, Dr. Renate Petzinger, and Luminita Sabau.. Illustrated. MIKEY FLOWERS 9/11; ASHES TO ASHES, DUST TO DNA, 2002, ars genetica, inc Michael Collarone and Kevin Clarke. Vivid photographs of the attack on the World Trade Center and 16 genetic meditations based on survivor"s DNA sequences. 96 pages, Illustrated. a+a architecture and art Beijing. "Who We Are, KC"s Conceptual Photography"	Super-Organism. Central Academy of Fine Arts Museum, Beijing, China. Typisch, Clischees von Juden und Anderen. Jewish Museum Berlin. "ART ET BIOTECHNOLOGIES" Louise Poissant and Ernestine Daubner. University of Quebec Press. CD Rom. 2004 "GENETIC REVERIES" Catalog, exhibition at Janos Gat Gallery, New York. 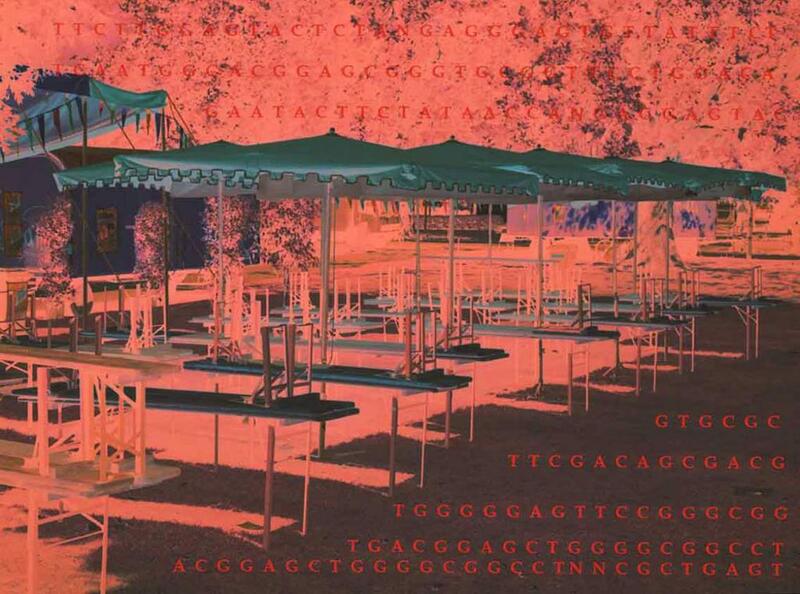 "THE MOLECULAR GAZE; ART IN THE GENETIC AGE" Suzanne Anker and Dorothy Nelkin. Cold Spring Harbor Laboratory Press. Illustrated. 2002 "ART IN OUR HOUSE- 7 PORTRAITS BY KEVIN CLARKE". B-W Bank Stuttgart. Catalog, illustrated. "PARADISE NOW, PICTURING THE GENETIC REVOLUTION" Marvin Heiferman and Carole Kismaric. Tang Museum, Skidmore College. 124pp. Illustrated. EL PUNTO DE LAS ARTES "K.C., la alusion como estrategia de construccion retratistica" Madrid, July. Carlota De Alfonso. Review. ABC CULTURAL "El retrato metafisico" Fernando Martin Galan. Review. 2001	"UNDER THE SKIN-BIOLOGICAL TRANSFORMATIONS IN CONTEMPORARY ART" Stiftung Wilhelm Lehmbruck Museum, Hatje Cantz. Catalog. Illustrated. "PARADISE NOW". Catalog by JGS Foundation, New York. Illustrated. "BLOOD; POWER, POLITICS, AND PATHOLOGY" Catalog to the exhibition at the Schirn Kunsthalle and Museum of Applied Arts, Frankfurt. Prestel, Illustrated, hardcover & soft. FAZ, Oct. 22. Ralf Christofori: "Show me your Genetic Formula and I"ll Tell You Who You Are: Kevin Clarke"s Photographs Cross Abstraction and Appearance". Review. WIRED, September, 2000. "The Essential James Watson". Illustrated. SCIENCE NEWS December, 2000 "Genetic Artistry". Illustrated. PHOTOGRAPHY NOW "Kevin Clarke"s Innen-schau Portrait im Museum Wiesbaden. text Michael Scheuermann . Illustrated. 1999 THE END OF THE ART WORLD". critical writings by Robert C. Morgan. "THE INVISIBLE BODY" Kevin Clarke, Dr. Volker Rattemeyer Museum Wiesbaden 118pp. Illustrated. ART KALEIDOSCOPE Frankfurt, October, 1999 "Experimental Portraits by Kevin Clarke. Illustrated. FRANKFURT ALLGEMEINE ZEITUNG "Die Menschen Mit Metaphern Beschreiben" Katharina Deschka October 23. Illustrated. 1997 VERNAL PASSAGE catalog exhibition at Grand Salon, New York. REVIEW review by Robert C. Morgan, "Vernal Passage". Dec 15. issue. the Blood of Poets" by Kevin Clarke. Spring 1996. Illustrated. of Poets", by Richard Ledes. Appeared on-line and in print form. illustrations and text "From The Blood Of Poets, Taken, Literally". 1993 TEMA CELESTE Spring 1993. "Kevin Clarke" by Alan Jones. Illustrated. Involving Polymerase Chain Reaction". Koepf, Hunkapillar, Venter, et al. Vol. 35, No 11, 1989. Blood supplied by Kevin Clarke. Illustrated. Kevin Clarke/Horst Wackerbarth, "The Red Couch". Illustrated. "THE RED COUCH, A PORTRAIT OF AMERICA", 1984 , Alfred van der Marck Editions/ Harper & Row. Photographs of Americans on a red velvet couch. Text by William Least Heat Moon. Softcover edition. STERN magazine, Germany. The Red Couch. 20pp color illustrations. May 11,1983. Two Gold Medals were awarded by the Art Director"s Club of Germany for this article, including Best Photography and Best Editorial in a magazine. It was the first double gold of the ADC"s 80 year history. 1984 LIFE "Red Rover" The Red Couch, November, 1982. . Illustrated. 1980	KAUFHAUSWELT "(Department Store World), 1980 Schirmer + Mosel Verlag, Munich. Black & white photographs by Kevin Clarke in Kaufhaus Des Westens (KaDeWe) in West Berlin. Text by Hans J. Scheurer. .
"KAUFHAUSWELT (Department Store World), 1980 Frankfurter Kunstverein. Black & white photographs by Kevin Clarke in Kaufhaus Des Westens (KaDeWe) in West Berlin. Text sby Dr. Peter Weiermair and Kevin Clarke. Catalog. Illustrated. Kevin Clarke conceptual portraits, DNA (Kevin Allan Clarke 1953-) is an American artist/photographer who was born in Brooklyn, New York. He is best known for his 1984 photography book The Red Couch, A Portrait of America and for his conceptual portraits that combine a metaphoric photographic image with the subject"s DNA sequence, known as DNA Portraits.